Where Did R.A. Dickey Come From and Is He Baseball’s Best Pitcher? R.A. Dickey knows how to throw a knuckleball better than just about any other pitcher in the Major League. It just took him awhile to figure it out. After wallowing around in relative obscurity and a couple stints in the minors, Dickey has come to life over the last three seasons and this year he is looking like the best pitcher in the game. His stats with the New York Mets this season are off the charts leading MLB with 11 wins, a 2.00 ERA and 103 strikeouts. One of the most amazing statistics however is that he has not even allowed an earned run since May 22. That’s almost a month! And three of his last four starts have been complete game wins that included a pair of one-hitters. Trading card companies don’t expect players like this to come out of nowhere, but even though he has posted respectable numbers the last couple seasons, there haven’t been all that many cards of the seemingly unhittable knuckleballer. 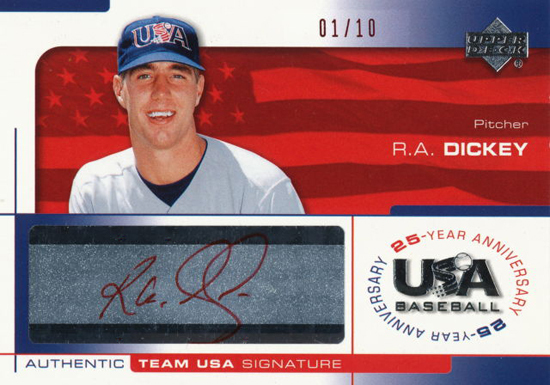 Perhaps some of his best are from Upper Deck’s 2004 USA Baseball sets. 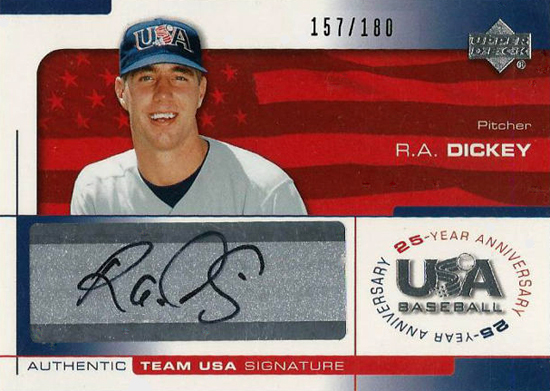 Not only can you find some of the earliest trading cards of Dickey, you can also find some rare autograph versions. 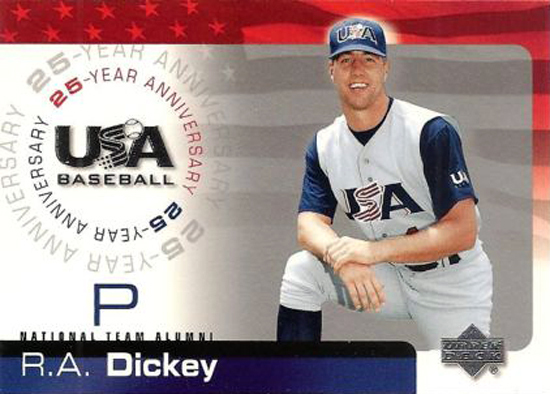 With Dickey likely to be the first knuckleballer to start the MLB All-Star Game in history, these may be cards you want to pick up sooner rather than later.